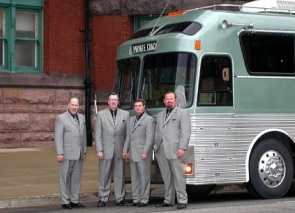 The Hoosier Harmony Quartet is a group of men, based in the Central Indiana area, that have been called together to spread the Gospel through Southern Gospel Music. while each of the members also work a full-time occupation. The members consist of Tom Correll (tenor and keyboards), Tim Kirkman (lead), Mike Shubert (baritone and bass guitar), and Steve Bahler (bass). The Hoosier Harmony Quartet has been blessed to be called to sing from Michigan to Tennessee, Missouri to Ohio and all the states in between. We go where we are called, sharing a program that is both entertaining and Spiritual. We desire that our music would uplift the true Gospel of Jesus Christ and bring a message of hope for all.